March 21 st , 2012. 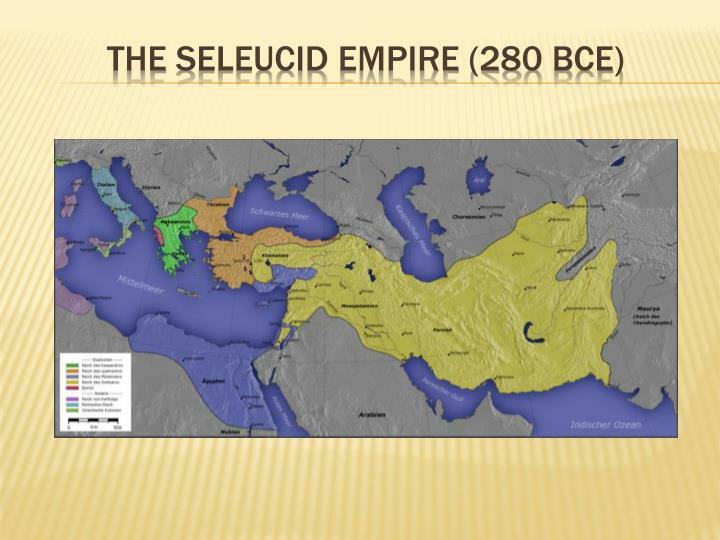 The Seleucid Empire (312 BCE – 63 BCE). 320 BCE – Seleucus I Nicator appointed Satrap of Babylon. 315 BCE – Seleucus I expelled as satrap by Antigonus I; flees to Egypt. 320 BCE – Seleucus I Nicator appointed Satrap of Babylon. 315 BCE – Seleucus I expelled as satrap by Antigonus I; flees to Egypt. 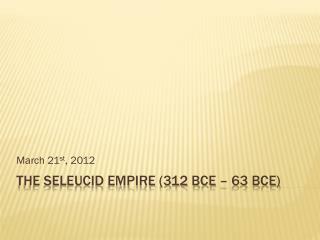 311 BCE – Seleucus I returns to Babylon; wrests control away from Antigonus I; starting date for Seleucid rule. 310-309 BCE – Demetrius I Poliorketes and Antigonus I defeated in a series of guerilla campaigns. 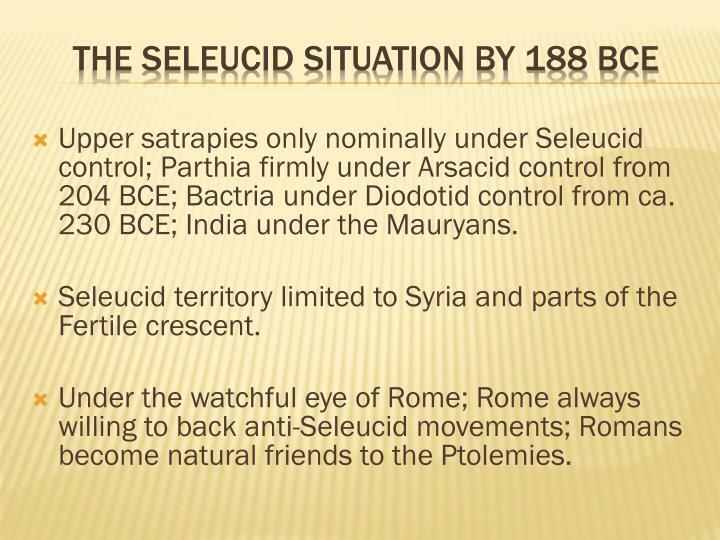 309-306 BCE – Seleucus I subdues upper satrapies; retakes Bactria-Sogdiana; invades India (under Chandragupta Maurya). 305 BCE – Seleucus recognizes Chandragupta Maurya’s sovereignty in India; marries daughter to Chandragupta in exchange for war-elephants. 301 BCE – Seleucus I, in alliance with Lysimachus, defeats Antigonus I and Demetrius I at Ipsus; Seleucus I receives Coile Syria and Phoenicia by treaty. 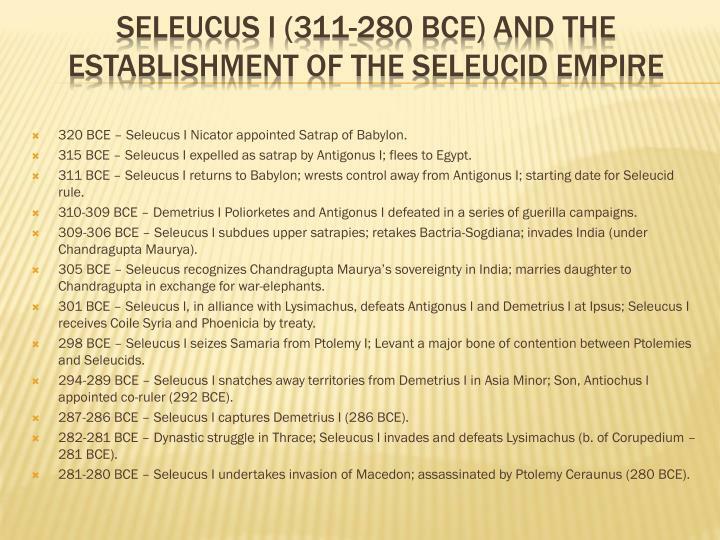 298 BCE – Seleucus I seizes Samaria from Ptolemy I; Levant a major bone of contention between Ptolemies and Seleucids. 294-289 BCE – Seleucus I snatches away territories from Demetrius I in Asia Minor; Son, Antiochus I appointed co-ruler (292 BCE). 287-286 BCE – Seleucus I captures Demetrius I (286 BCE). 282-281 BCE – Dynastic struggle in Thrace; Seleucus I invades and defeats Lysimachus (b. of Corupedium – 281 BCE). 281-280 BCE – Seleucus I undertakes invasion of Macedon; assassinated by Ptolemy Ceraunus (280 BCE). Seleucus I Nicator (311-280 BCE). Antiochus I Soter (281-261 BCE). Antiochus II Theos (261-246 BCE). 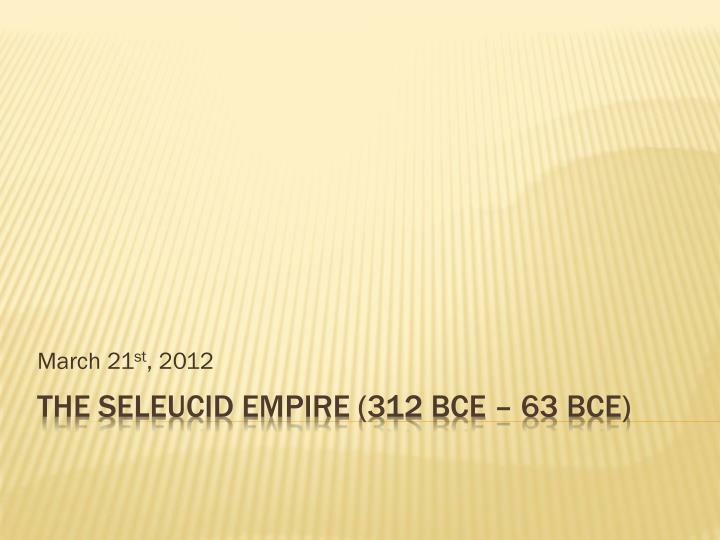 Seleucus II Callinicus (246-225 BCE). Seleucus III Ceraunus (225-222 BCE). Antiochus III Megas (222-187 BCE). Seleucus IV Philopator (187-175 BCE). Antiochus IV Epiphanes (175-164 BCE). Antiochus V Eupator (164-162 BCE). Demetrius I Soter (161-150 BCE). Alexander I Balas (152-145 BCE). Demetrius II Nicator (145-138 BCE). Antiochus VI Dionysus (145-140 BCE). Antiochus VII Sidetes (138-129 BCE). Demetrius II Nicator (129-125 BCE). Alexander II Zabinas (129/123 BCE). Cleopatra Thea & Antiochus VIII Grypus (125/121 BCE). Antiochus VIII Grypus (121/96 BCE). Antiochus IX Cyzicenus (115-95 BCE). Demetrius II Eucareus (97-87 BCE). Seleucus VI Epiphanes Nicator (96-94 BCE). Antiochus XI Epiphanes Philadelphus (95-92 BCE). Philip I Philadelphus (95-75 BCE). Antiochus X Eusebes Philopator (94-88 BCE). Antiochus XII Dionysus (87-82 BCE). Tigranes II the Great of Armenia (74-69 BCE). Antiochus XIII Asiaticus (69-64 BCE). Philip II Philoromaeos (67-65 BCE). 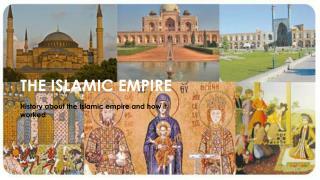 Largest of the successor kingdoms. Most geographically and ethnically diverse. 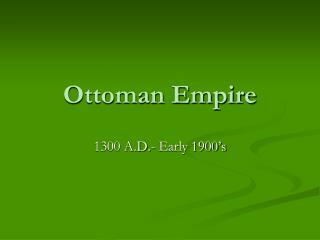 Co-extensive with the Persian Empire pre-Alexander. Alexander’s campaigns by-passed large swaths of territory. Control of hinterland and upper satrapies always tenuous. 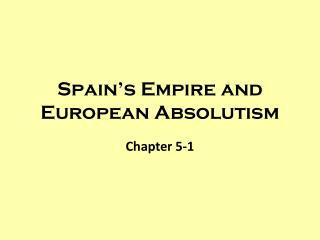 Control of Western satrapies tenuous owing to ambitions of other successor states (esp. Ptolemies). Interference of Rome after ca. 192 BCE. Antiochus I Soter (281-261 BCE) – The First Syrian War (280-279 BCE, 274-271 BCE); Cappadocia independent under Ariarathes II (279 BCE); Gallic incursions (279-275 BCE); Eumenes I of Pergamum gains independence (263-262 BCE); loss of control in north-western Asia Minor. 230-227 BCE – Parthians revolt and overrun Hyrcania; Diodotus (Satrap of Bactria-Sogdiana) declares independence (230 BCE); Seleucus II forced to negotiate a settlement; loss of control in the upper satrapies. 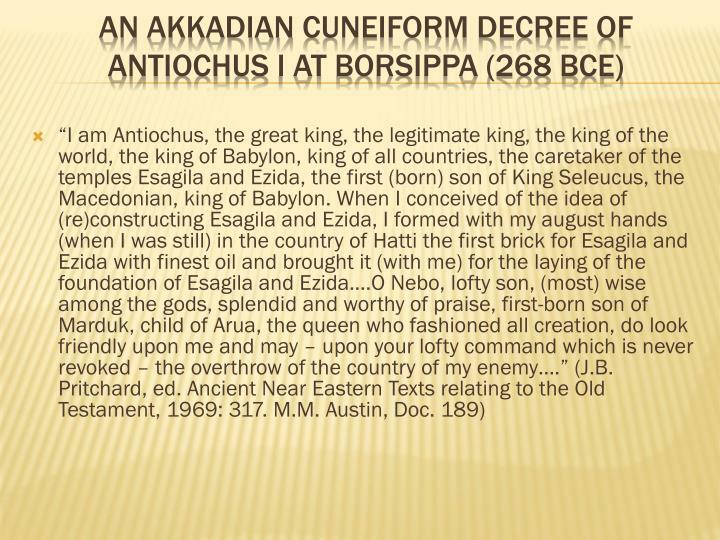 The “anabasis” of Antiochus III (212-205 BCE) – Re-affirms Seleucid suzerainty over Parthia and recognizes Euthydemus I as vassal king of Bactria, re-establishes ties with Mauryian India. The Syrian War with Rome (192-188 BCE) – Defeated at b. of Magnesia (189 BCE); Peace of Apameia (188 BCE), Rome gives Asia Minor to Rhodes and Pergamum. 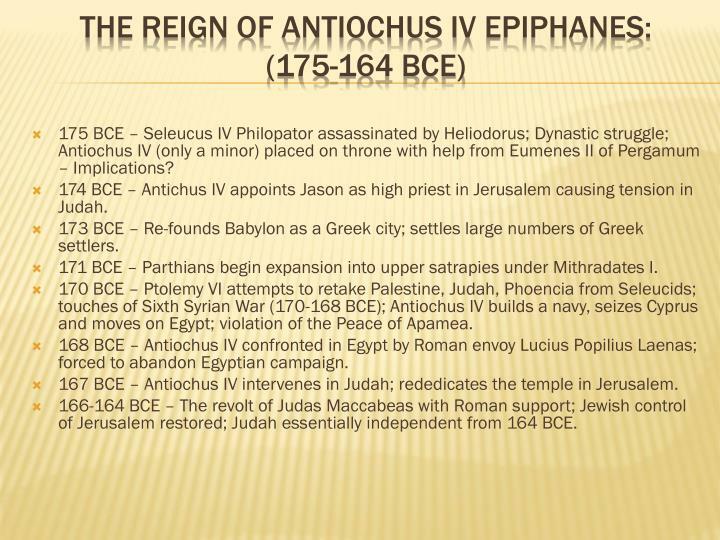 Antiochus IV Epiphanes lauches Sixth Syrian War (170-168 BCE) in “defense” of the Egyptian boy-king Ptolemy VI; violation of Peace of Apameia brings Roman intervention (Gaius Popilius Laenas); Antiochus IV interference in Judah results in Revolt of the Maccabees (166 BCE) with Roman support; Judah wins nominal independence from Seleucid control. 245 BCE – Seleucus II Callinicus just succeeded to throne (246 BCE); Andragoras (satrap of Parthia) declares independence; Parmi take advantage of crisis to overrun Parthia. 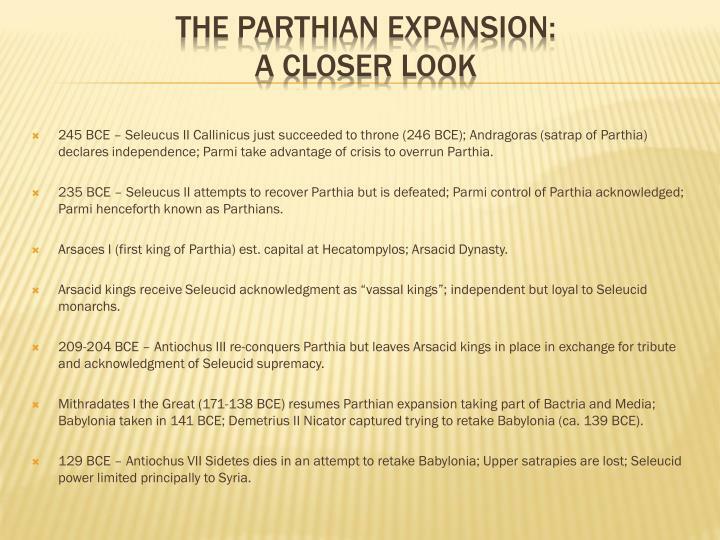 235 BCE – Seleucus II attempts to recover Parthia but is defeated; Parmi control of Parthia acknowledged; Parmi henceforth known as Parthians. Arsaces I (first king of Parthia) est. capital at Hecatompylos; Arsacid Dynasty. 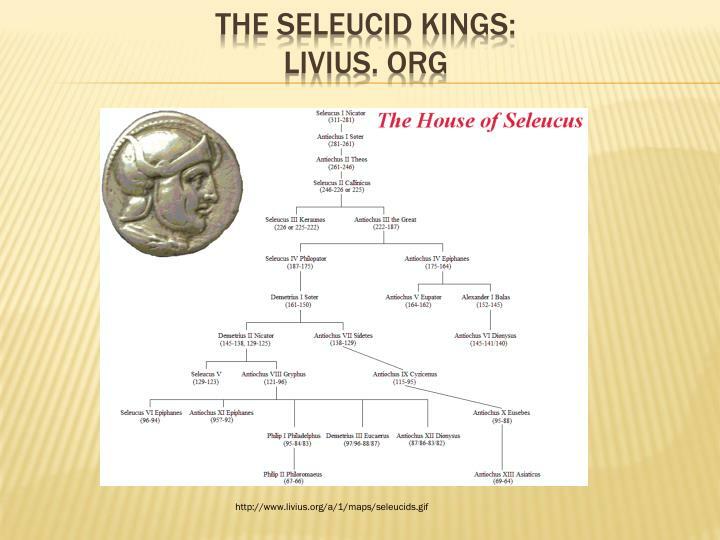 Arsacid kings receive Seleucid acknowledgment as “vassal kings”; independent but loyal to Seleucid monarchs. 209-204 BCE – Antiochus III re-conquers Parthia but leaves Arsacid kings in place in exchange for tribute and acknowledgment of Seleucid supremacy. Mithradates I the Great (171-138 BCE) resumes Parthian expansion taking part of Bactria and Media; Babylonia taken in 141 BCE; Demetrius II Nicator captured trying to retake Babylonia (ca. 139 BCE). 129 BCE – Antiochus VII Sidetes dies in an attempt to retake Babylonia; Upper satrapies are lost; Seleucid power limited principally to Syria. Confrontation begins with Antiochus III the Great (222-187 BCE). 205 BCE – Alliance between Antiochus III and Philip V of Macedon to invade Egypt (Ptolemy IV having died); The Fifth Syrian War (202-195 BCE). 196 BCE – Antiochus III invades Thrace; confronted by a Roman embassy demanding abandonment of territories in Asia; Antiochus III ignores the threat – occupies Thrace. 194 BCE – Antiochus’ III operations in Hellespont angers Eumenes II (king of Pergamum, friend of Rome); Eumenes II complains to Rome. 192 BCE – Antiochus III invited by Aetolian League to “free the Greeks”; The Syrian War (192-188 BCE); Hannibal of Carthage a special advisor to Antiochus III. 191 BCE – Philip V of Macedon and the Achaean League side with Rome; Antiochus III defeated at b. of Thermopylae; Aetolian League abandons Antiochus III. 190 BCE – Roman sign an armistice with Aetolian League; Hannibal defeated by Rhodes at sea; Rome and Pergamum defeat Antiochus III at b. of Magnesia. 190-189 BCE – Romans mopping up. 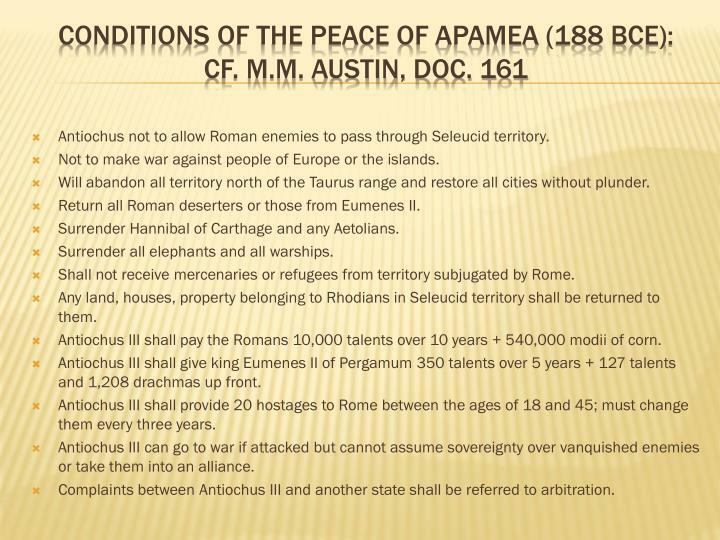 188 BCE – Peace of Apamea. “Just as Antiochus’ designs in Thrace were going as he wished, Lucius Cornelius and his colleagues sailed into Selymbria; they were the ambassadors sent by the Senate to arrange peace between Antiochus and Ptolemy (V). 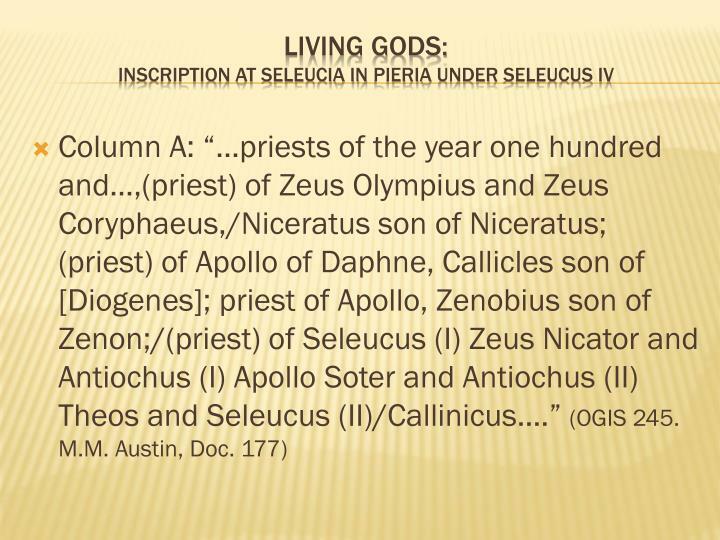 At the same time there arrived three of the ten commissioners, PubliusLentulus from Bargylia and LuciusTerrentius and PubliusVillius from Thasos. 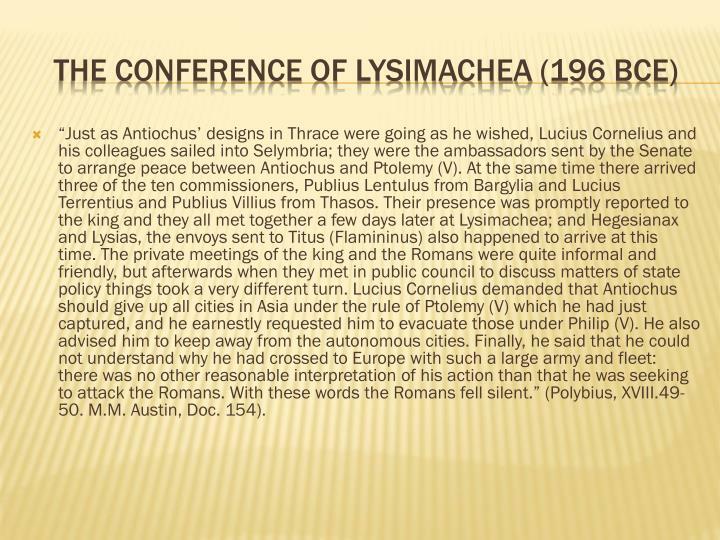 Their presence was promptly reported to the king and they all met together a few days later at Lysimachea; and Hegesianax and Lysias, the envoys sent to Titus (Flamininus) also happened to arrive at this time. The private meetings of the king and the Romans were quite informal and friendly, but afterwards when they met in public council to discuss matters of state policy things took a very different turn. 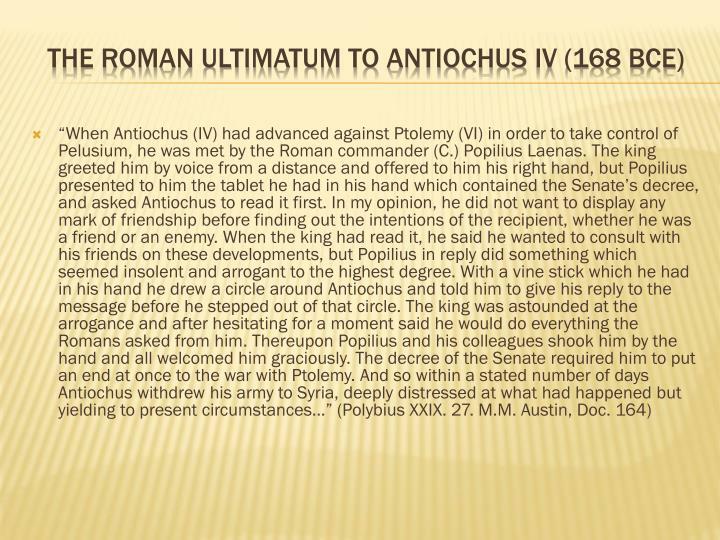 Lucius Cornelius demanded that Antiochus should give up all cities in Asia under the rule of Ptolemy (V) which he had just captured, and he earnestly requested him to evacuate those under Philip (V). He also advised him to keep away from the autonomous cities. Finally, he said that he could not understand why he had crossed to Europe with such a large army and fleet: there was no other reasonable interpretation of his action than that he was seeking to attack the Romans. 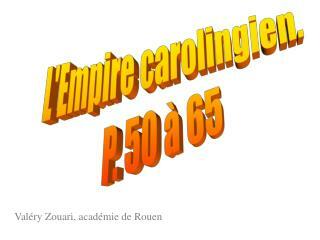 With these words the Romans fell silent.” (Polybius, XVIII.49-50. M.M. Austin, Doc. 154). Antiochus not to allow Roman enemies to pass through Seleucid territory. Not to make war against people of Europe or the islands. 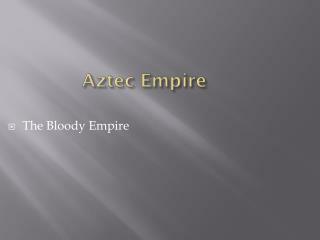 Will abandon all territory north of the Taurus range and restore all cities without plunder. Return all Roman deserters or those from Eumenes II. Surrender Hannibal of Carthage and any Aetolians. Surrender all elephants and all warships. Shall not receive mercenaries or refugees from territory subjugated by Rome. 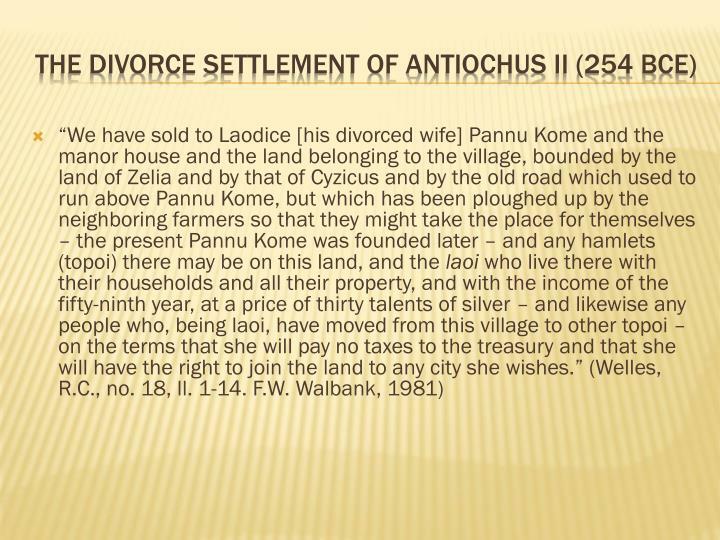 Any land, houses, property belonging to Rhodians in Seleucid territory shall be returned to them. Antiochus III shall pay the Romans 10,000 talents over 10 years + 540,000 modii of corn. 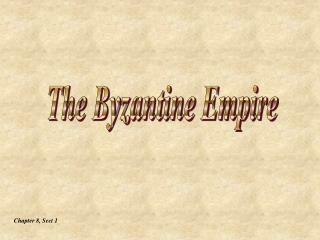 Antiochus III shall give king Eumenes II of Pergamum 350 talents over 5 years + 127 talents and 1,208 drachmas up front. 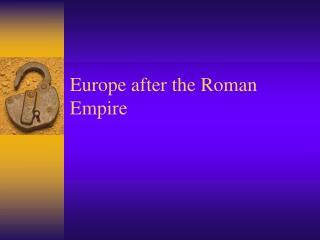 Antiochus III shall provide 20 hostages to Rome between the ages of 18 and 45; must change them every three years. Antiochus III can go to war if attacked but cannot assume sovereignty over vanquished enemies or take them into an alliance. Complaints between Antiochus III and another state shall be referred to arbitration. 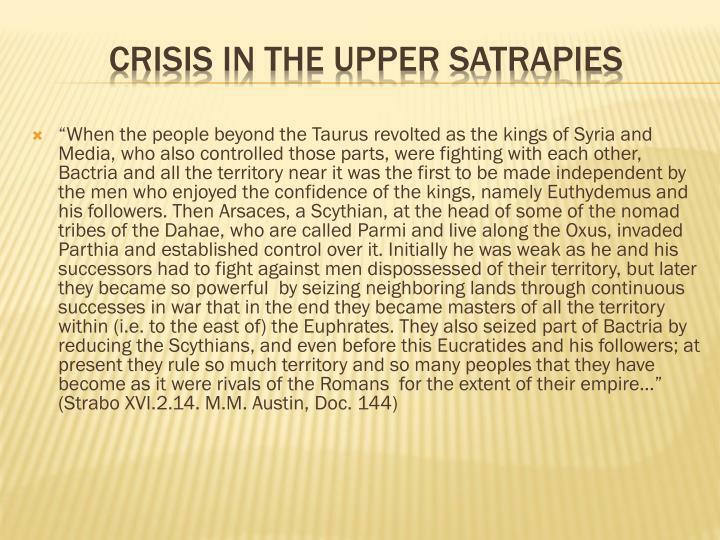 Upper satrapies only nominally under Seleucid control; Parthia firmly under Arsacid control from 204 BCE; Bactria under Diodotid control from ca. 230 BCE; India under the Mauryans. 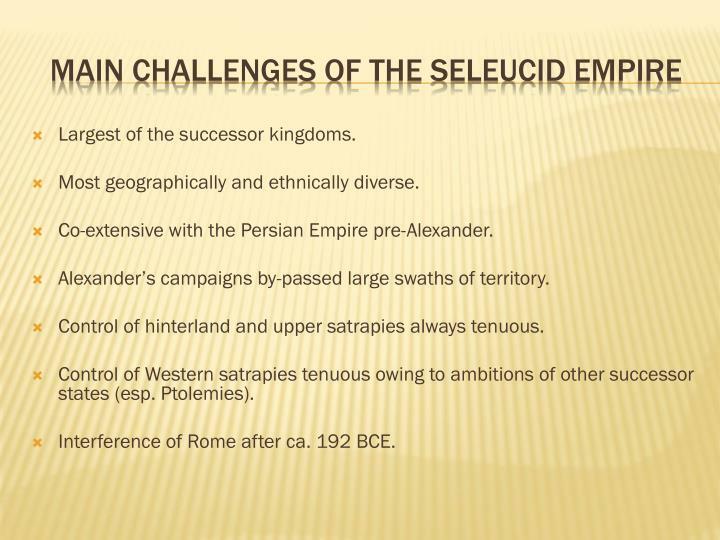 Seleucid territory limited to Syria and parts of the Fertile crescent. Under the watchful eye of Rome; Rome always willing to back anti-Seleucid movements; Romans become natural friends to the Ptolemies. 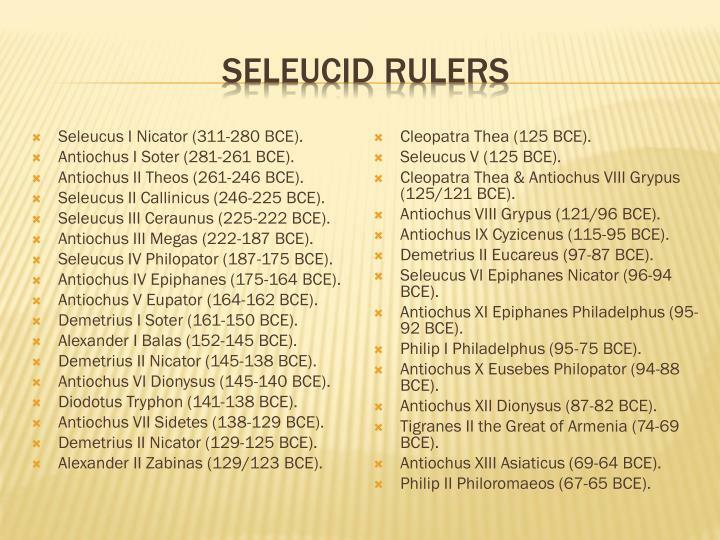 189 BCE – Seleucus IV made co-ruler with his father (Antiochus III). 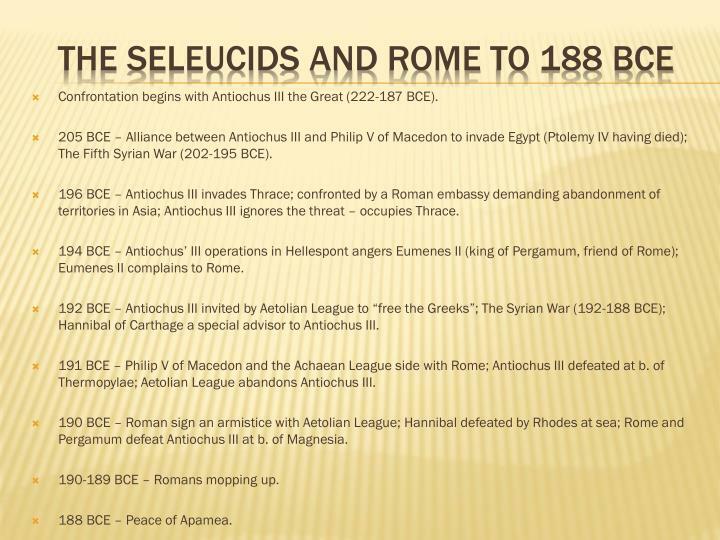 187 BCE – Antiochus III dead; Seleucus IV attempts diplomacy to recover lost territories (esp. in the east) – unsuccessful. 178 BCE – Seleucus IV marries his daughter Laodice V to Perseus (king of Macedon); Eumenes II of Pergamum denounces Seleucus IV to Rome (i.e. marriage a violation of the Peace of Apamea); Seleucus IV forced to deliver son Demetrius to Rome as a hostage. 175 BCE – Seleucus IV having difficulty paying indemnity to Rome; Heliodorus sent to Jerusalem to take money from the temple (unsuccessful); Heliodorus returns and assassinates Seleucus IV; succeeded by brother, Antiochus IV Epiphanes. 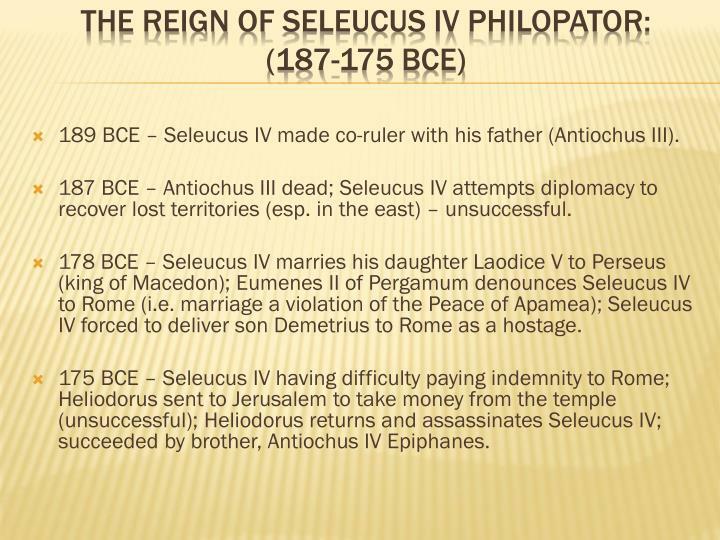 175 BCE – Seleucus IV Philopator assassinated by Heliodorus; Dynastic struggle; Antiochus IV (only a minor) placed on throne with help from Eumenes II of Pergamum – Implications? 174 BCE – Antichus IV appoints Jason as high priest in Jerusalem causing tension in Judah. 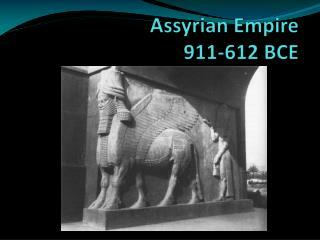 173 BCE – Re-founds Babylon as a Greek city; settles large numbers of Greek settlers. 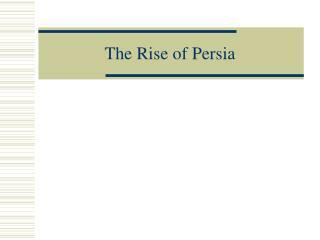 171 BCE – Parthians begin expansion into upper satrapies under Mithradates I. 170 BCE – Ptolemy VI attempts to retake Palestine, Judah, Phoencia from Seleucids; touches of Sixth Syrian War (170-168 BCE); Antiochus IV builds a navy, seizes Cyprus and moves on Egypt; violation of the Peace of Apamea. 168 BCE – Antiochus IV confronted in Egypt by Roman envoy LuciusPopiliusLaenas; forced to abandon Egyptian campaign. 167 BCE – Antiochus IV intervenes in Judah; rededicates the temple in Jerusalem. 166-164 BCE – The revolt of Judas Maccabeas with Roman support; Jewish control of Jerusalem restored; Judah essentially independent from 164 BCE. 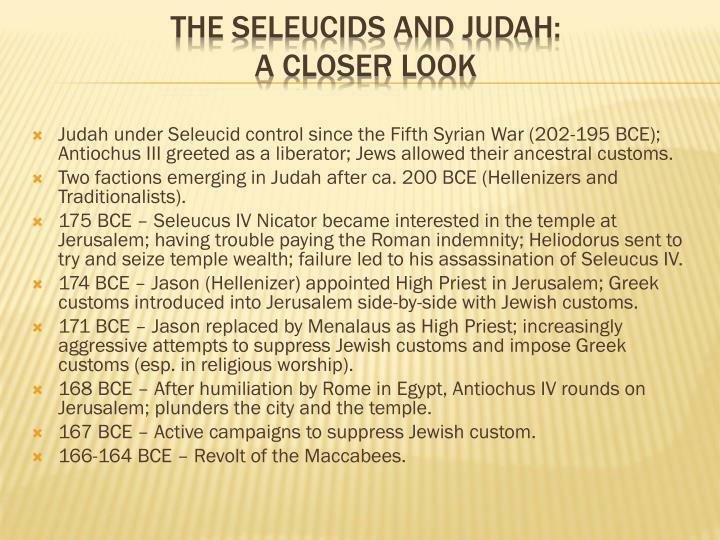 Judah under Seleucid control since the Fifth Syrian War (202-195 BCE); Antiochus III greeted as a liberator; Jews allowed their ancestral customs. Two factions emerging in Judah after ca. 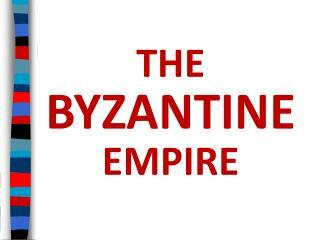 200 BCE (Hellenizers and Traditionalists). 175 BCE – Seleucus IV Nicator became interested in the temple at Jerusalem; having trouble paying the Roman indemnity; Heliodorus sent to try and seize temple wealth; failure led to his assassination of Seleucus IV. 174 BCE – Jason (Hellenizer) appointed High Priest in Jerusalem; Greek customs introduced into Jerusalem side-by-side with Jewish customs. 171 BCE – Jason replaced by Menalaus as High Priest; increasingly aggressive attempts to suppress Jewish customs and impose Greek customs (esp. in religious worship). 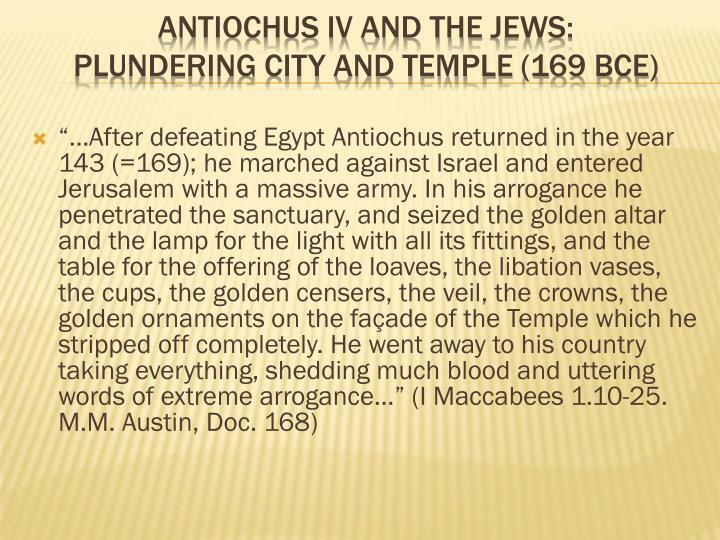 168 BCE – After humiliation by Rome in Egypt, Antiochus IV rounds on Jerusalem; plunders the city and the temple. 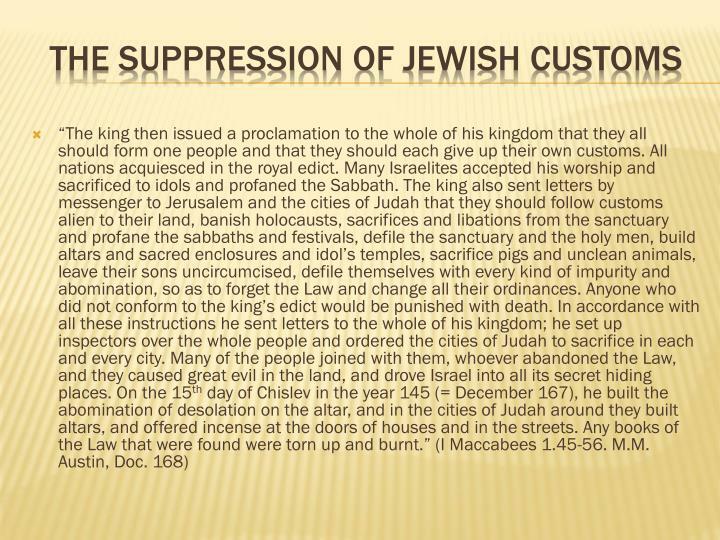 167 BCE – Active campaigns to suppress Jewish custom. 166-164 BCE – Revolt of the Maccabees. “…And out of respect for the Temple he issued a proclamation throughout the whole kingdom in the following terms: ‘No foreigner shall be allowed to enter the precinct of the Temple which is forbidden to the Jews, except for those who are accustomed to doing so after purifying themselves in accordance with ancestral custom. 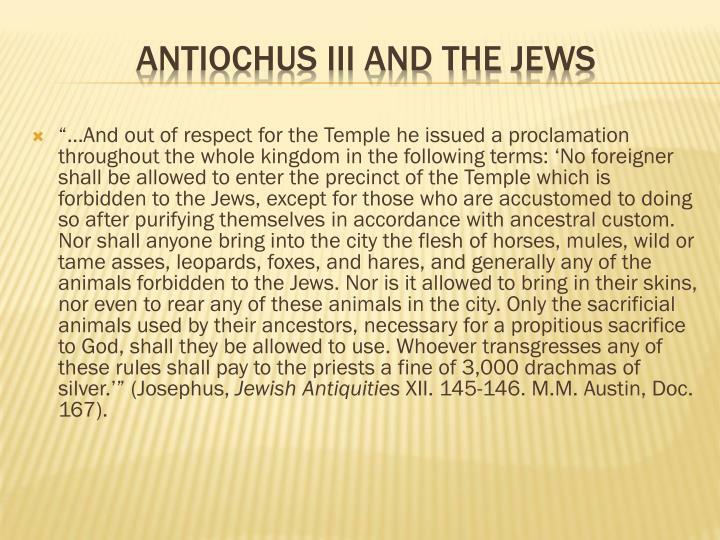 Nor shall anyone bring into the city the flesh of horses, mules, wild or tame asses, leopards, foxes, and hares, and generally any of the animals forbidden to the Jews. Nor is it allowed to bring in their skins, nor even to rear any of these animals in the city. Only the sacrificial animals used by their ancestors, necessary for a propitious sacrifice to God, shall they be allowed to use. Whoever transgresses any of these rules shall pay to the priests a fine of 3,000 drachmas of silver.’” (Josephus, Jewish Antiquities XII. 145-146. M.M. Austin, Doc. 167). Persian infrastructure left in place; Seleucid monarchs appoint satraps to govern satrapies; powerful satrapies kept loyal by recognizing them as independent vassal kingdoms (i.e. Bactria after 230 BCE). Four main capitals (Ecbatana, Persis, Sousa, Seleucia on Tigris); capital really where Seleucid court happens to be at the moment. 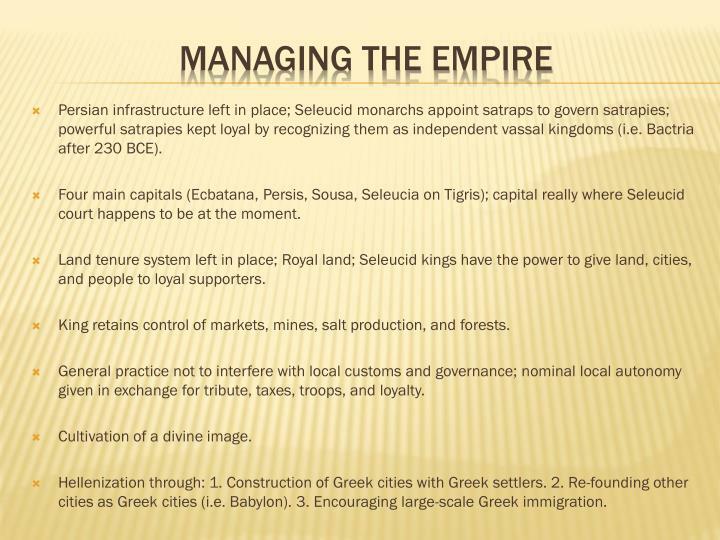 Land tenure system left in place; Royal land; Seleucid kings have the power to give land, cities, and people to loyal supporters. King retains control of markets, mines, salt production, and forests. General practice not to interfere with local customs and governance; nominal local autonomy given in exchange for tribute, taxes, troops, and loyalty. Cultivation of a divine image. Hellenization through: 1. Construction of Greek cities with Greek settlers. 2. Re-founding other cities as Greek cities (i.e. Babylon). 3. Encouraging large-scale Greek immigration. 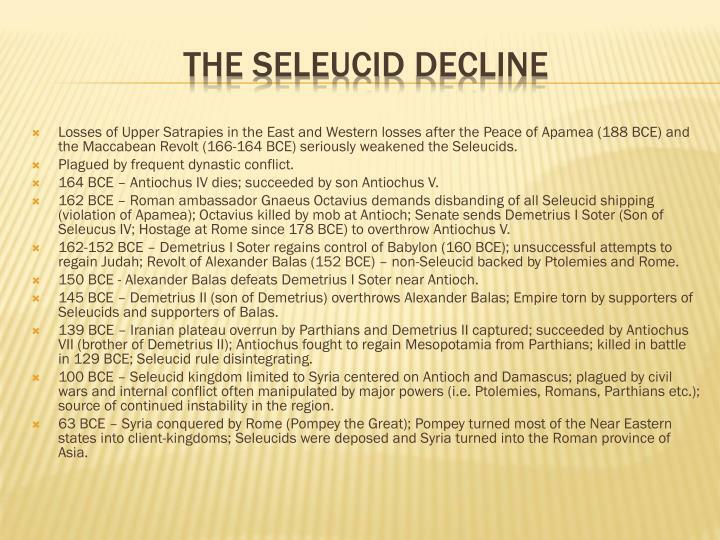 Losses of Upper Satrapies in the East and Western losses after the Peace of Apamea (188 BCE) and the Maccabean Revolt (166-164 BCE) seriously weakened the Seleucids. Plagued by frequent dynastic conflict. 164 BCE – Antiochus IV dies; succeeded by son Antiochus V.
162 BCE – Roman ambassador GnaeusOctavius demands disbanding of all Seleucid shipping (violation of Apamea); Octavius killed by mob at Antioch; Senate sends Demetrius I Soter (Son of Seleucus IV; Hostage at Rome since 178 BCE) to overthrow Antiochus V.
162-152 BCE – Demetrius I Soter regains control of Babylon (160 BCE); unsuccessful attempts to regain Judah; Revolt of Alexander Balas (152 BCE) – non-Seleucid backed by Ptolemies and Rome. 150 BCE - Alexander Balas defeats Demetrius I Soter near Antioch. 145 BCE – Demetrius II (son of Demetrius) overthrows Alexander Balas; Empire torn by supporters of Seleucids and supporters of Balas. 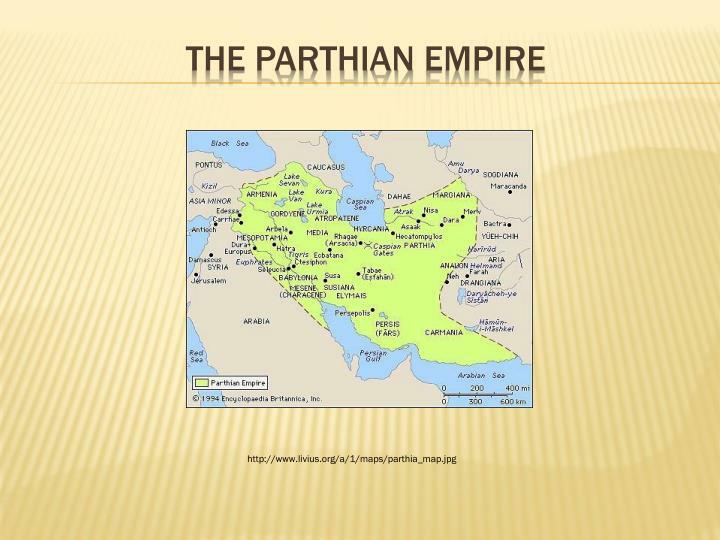 139 BCE – Iranian plateau overrun by Parthians and Demetrius II captured; succeeded by Antiochus VII (brother of Demetrius II); Antiochus fought to regain Mesopotamia from Parthians; killed in battle in 129 BCE; Seleucid rule disintegrating. 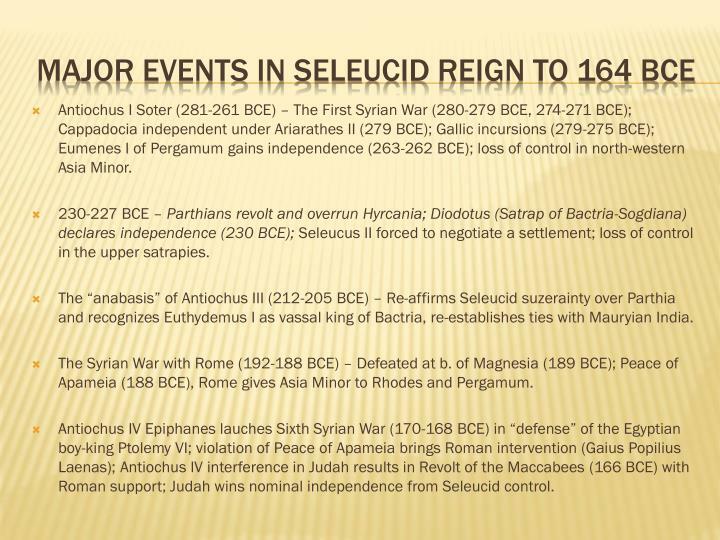 100 BCE – Seleucid kingdom limited to Syria centered on Antioch and Damascus; plagued by civil wars and internal conflict often manipulated by major powers (i.e. Ptolemies, Romans, Parthians etc. ); source of continued instability in the region. 63 BCE – Syria conquered by Rome (Pompey the Great); Pompey turned most of the Near Eastern states into client-kingdoms; Seleucids were deposed and Syria turned into the Roman province of Asia. 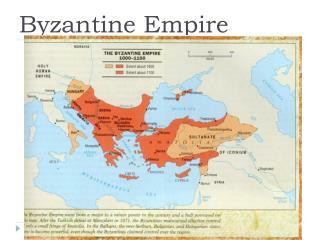 Byzantine Empire -. main idea	. 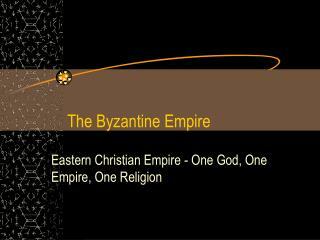 after the fall of the roman empire in the west, the byzantine empire emerged as the dominant eastern power, with constantinople as its political, economic, and religious center. 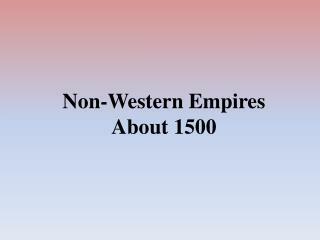 the empire lasted over 1,000 years. Do Now -. 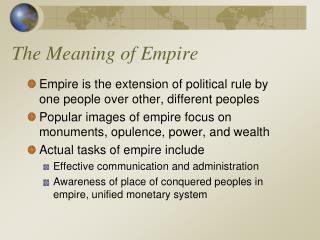 identify some elements of a successful empire? 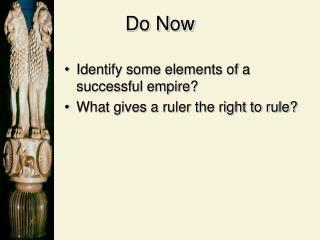 what gives a ruler the right to rule?. 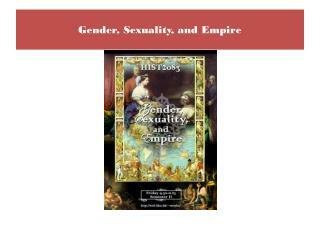 primary document: compare empires. mauryan empire 322-185 bce. 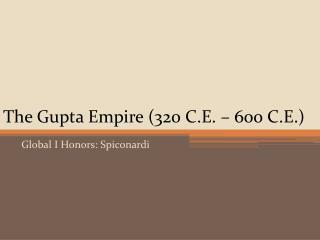 gupta empire 320-499 ce. chandragupta : 321 bce-298 bce. unified india.